There has been a lot of discussion this week regarding pressure on the Emergency Department at Flinders Medical Centre in South Australia. Rack ’em and stack ’em! I have a ‘soft spot’ for Flinders. I worked there as a junior resident and then registrar in the late 90s/early naughties and like to think that I learned a bit. The Consultant staff were excellent and engaged in training. The nursing staff were fantastic. And the work was great fun – I certainly enjoyed the immediacy of emergency/critical care but was seduced away to rural medicine by the lifestyle advantages and variety that this work offered. More importantly, the one thing that affected my decision not to complete training in ED/ICU was the lack of control over factors in my work (some might say that dealing with Country Health SA is similar, and you would be right, but more of that in another post). The big issue for the ED is ‘access block’ – the inability to efficiently deal with emergency patients because there are insufficient beds in the ED..because there are patients waiting for beds ‘upstairs’ ie: in medical and surgical wards. And why are there no beds? Because the medical and surgical wards are either run at 100% capacity leaving no room for ‘surge capacity’…and/or that medical beds may be clogged with patients awaiting discharge to home, nursing home or country hospital. Because there is no slack in the system, the clogging of ward beds filters back to the ED causing access block. And when the ED is full, the unhappy situation arises when ambulances cannot handover their patients because the ED is full and ambulances are ‘ramped’(literally wait on the ramp outside the ED). And tying up ambulances waiting outside EDs means there are not enough ambulances to deal with emergencies in the community. 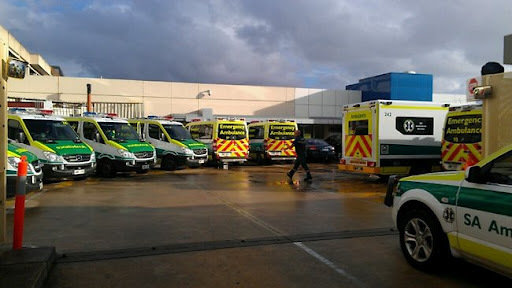 Ramping has been a common phenomenon at Flinders Medical Centre in the past few weeks. Last Friday I was at an EMST course at Flinders and heard that the Director of ED, Dr Di King had resigned after being called into the CEOs office and asked to guarantee that ramping would not occur. Of course this is impossible – Dr King has no more control over this than anyone else – the solution lies with the CEO and Minister of Health, not the ED Director. And so Di resigned, putting more pressure on a beleaguered Health Minister. Yesterday Dr Dave Teubner came out and said it was safer for people to remain in an ambulance than to be seen in the ED. Dave is a passionate ED doc…he is not some hopeless academic, but a chap who really gives a damn. He is of course correct – it is better for people to be at least in an ambulance with oxygen, suction and a paramedic than lost in a corridor in the ED, unobserved and awaiting assessment or treatment with access to neither. In essence, the whole idea of a well run health service should be to ensure that care is escalated with every referral. It is frankly dangerous to have care take a step downwards from ambulance to ED, as is the case at FMC when under bed pressure. This is a concept that is a particular hobby horse of mine – the idea of ensuring there is never a ‘therapeutic vacuum’ or ‘inertia of care’. Every single thing we do should improve patient care, not stall it or even detract from it. Certainly people admitted to an ED should see an increase in the level of care delivered to them. And so on…every single doctor, nurse, paramedic is doing his or her utmost to make this happen. But the system seems to conspire against us. And of course this is not just about ramping in the ED. It also applies to rural medicine, to the operating theatre, to in-patient care and to discharge. Well, political pressure is one – I would imagine that Dr Di King’s resignation has served to highlight the issue locally and perhaps prod the Health Minister into action. More so, we can engage and try to make things better. I’ve been revitalised in the past few months by some of the information coming through the blog-o-sphere, with concepts of relevance to my practice that one is not going to get from a textbook or clinical placement. So I’ve done a survey on difficult airway equipment for rural GP-anaesthetists. I’ve offered to run some small group scenario-based sessions for nursing staff at the end of each of my anaesthetic lists and whenever I am on call for A&E. And I’ve been developing a web-based repository of emergency training for local use…how to set up the oxylog, where to find and use the rapid rhino kit for dealing with an epistaxis, a dump mat for RSI etc. Another new idea is borrowed from the UK – a ‘one minute wonder’ fortnightly update on topics of relevance for our multiskilled rural nursing staff – basically a single A4 poster explaining how to find/set up/use a piece of ED equipment – displayed on the wall above the iStat machine to give people something to read whilst waiting for the iStat or Troponin reader to do it’s stuff. Small things, but they might make emergency management in the bush easier. Of course, the astute reader would wonder why these initiatives are not flowing ‘top down’. It would seem intuitive to have a minimum standard of airway equipment in rural hospitals, to have standardised ED kit and protocols, to train staff in equipment use beyond the token annual ALS refresher. But this doesn’t happen. Change takes time, there needs to be initiative and drive, and solutions need to be appropriate to the local situation. Anyone else got any pointers to drive change and improve emergency management in rural areas? This entry was posted in Emergency, Minister Hill, Triage, Workforce and tagged Emergency. Bookmark the permalink. Hi TimGood meeting you in Darwin. Still following your blog with interest. Spare a thought for us in ED currently battling with the Winter (lack of) Bed Crisis. I do not see the situation improving any time soon.